"SOAR! with Resilience®: The Interactive Book for Overcoming Obstacles & Achieving Success"
A must read for anyone struggling to take their personal or professional life to a higher level of success and satisfaction. Eileen has created a book where she is "your" business, life, parenting or transition coach - partner! Aging is the body's reaction to environmental and psychological stress. How we deal with stress profoundly affects the way we look and feel. Eileen made sure she left no stone unturned in the area of dealing with stress. She gives you several very effective techniques to deal with stress in your life. 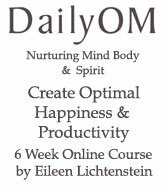 "Eileen's interactive book is both enlightening and motivating. Eileen truly partners with you as your Peak Performance Success Coach as she takes you step-by-step through her process of achieving success." "Anyone who wants to achieve his or her potential will benefit by reading and doing the exercises in the book SOAR! with Resilience®. It's a down to earth book that will help you to achieve your dreams -"
"When you have made up your mind to create change within, you should turn to Eileen Lichtenstein. 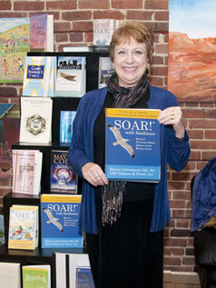 Her book, SOAR! with Resilience® will walk you through every step of the way. Sharing her knowledge, past experiences, and tried and true techniques, Eileen will take you to the next step with her inventive and creative questions, worksheets and instruction. It's definitely a book worth your time." Don't wait to start turning your ailing business - or life - around. Be proactive: If you're doing well, SOAR! will propel you to a higher level of success and happiness! Thinking about becoming an entrepreneur? Looking for a career change, a reinvention? And if you are simply feeling overwhelmed with life, "sandwich generation" or parenting issues, this book will help get you get unstuck, be fearless and SOAR! Download "SOAR! 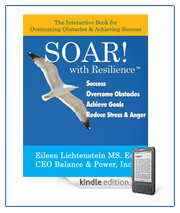 with Resilience® the Interactive Book for Overcoming Obstacles & Achieving Success" right now and get your business and life ready to Soar! Can't wait for the book and you want the downloadable version? Once payment is completed you will be directed immediately to the PDF download. "SOAR! 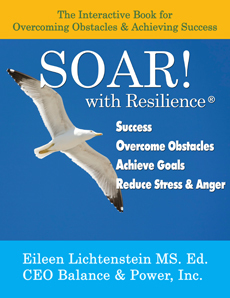 with Resilience® the Interactive Book for Overcoming Obstacles & Achieving Success"
Also Available: "SOAR! with Resilience® the Interactive Book for Overcoming Obstacles & Achieving Success"